Forms are lead capture elements. Like all components in Landing Lion, you can add a form to any page or page template by dragging it from the Right Pane and dropping it on the Canvas. Form Fields - add, reorder, edit, and remove form fields. 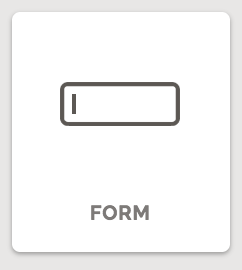 Add a form field by clicking the grey "+" (in the top right corner). Use the grey "||" handle on to the left to reorder your items. To remove an existing item, click the red "x" to the right of it. Form Theme - change your form's theme here. You can choose one of the four themes - Standard (default), Flat, Underline Dark, and Underline Light. Button Styles - change the color, size and shape of your submit button. You can choose one of the three sizes: small, medium, large. You can choose one of the three shapes: square, rounded, pill. Button Theme - change the submit button's theme. You can choose one of the four themes: flat, blocky, bubbly, and outlined. On Submit - make something happen after the form is submitted. By "Default", the information a visitor submits goes to your email as a lead alert and a "Thank You Message" pops up. Choose from one of the options in the "On Click" dropdown: Default, Open Link, Download File, Print Image, or POST Data. 💡Choosing other actions will not affect the recording of your form data. Thank You Message - customize the message that appears in a modal when this form is submitted by a visitor. Manage Form Integrations - takes you to your page's integration settings.